After a a very snowy week luckly the weather improved for one of our busiest Flower weekends of the year! The Flower Barn, Rothley was open for the day with bouquets and floral arrangments coming out of our ears. As usual my lovely Mummy was on hand to help with her expert sweeping, flower prepping and tea making skills! 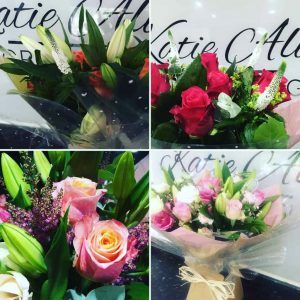 The bipper van was happily zipping around leicestershire to deliver bouquets to lots of happy mums, this has to be the best part of my job, love seeing their smiling faces. Thank you to all of my wonderful customers for their continued support, it means so much to me.